Walking with Jesus: Day 197: John 20:1-10 & Psalm 89 - What's the Difference Between Seeing and Seeing? Day 197: John 20:1-10 & Psalm 89 - What's the Difference Between Seeing and Seeing? What's the Difference Between Seeing and Seeing? If you're a man and you're married, then you've probably had the experience of being asked, "Do you see that?" and looking and wondering, What exactly am I supposed to see? If you're blessed to be a husband, then you know there is a big difference between seeing and seeing. You probably also know the difference between seeing and seeing from the other perspective if you're the parent of a teenager. You walk into their room and ask, "Do you see this?" and they stare blankly back at you and reply, "See what?" Well, Peter and John had a seeing vs. seeing experience on that first Resurrection Day. They both ran to the tomb at the report of Mary Magdalene. John reached the tomb first; he was younger, after all. But John didn't go into the tomb. He just looked in and saw the linen cloths lying there. 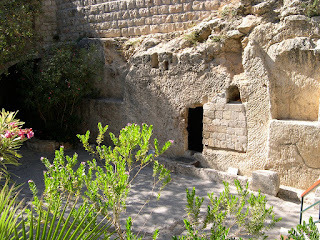 Peter went into the tomb and also saw the linen cloths. Then John entered the tomb and really saw and believed. 1. The first time (v. 5), when John saw the linen cloths, the word is blepo, which is perhaps the most basic word for seeing with the eye. 2. In the next verse (v. 6), when Peter enters and sees the linen cloths, the word is theoreo, which is a stronger verb, meaning to look and consider, to view attentively. 3. Finally, when John entered the tomb, we're told "he saw and believed." (v. 8) This time, the verb for saw is horao, which can mean to perceive or to pay heed. This is the verb that is used by Matthew to descibe the wise men seeing the star; it is a seeing with understanding. Thus, John "saw and believed." His seeing was with an understanding that led to faith. In life, so much depends on really being able to see. May the Lord give us the grace to be able to see with understanding and to respond with faith, just as John did, believing with eyes of faith, before he saw the risen Lord and before he even fully understood the Scriptures. Lord, grant us that kind of sight!